Nevis View Bed and Breakfast enjoys an ideal location amid the stunning scenery of the Lochaber area. Easily reached either by car, bus or train, it is only 4 miles from Fort Wiliam town centre. The roads leading to the area are a joy to drive on with journey times taking about two and a half hours from Glasgow and one and a half hours from Inverness. Nevis View is in an ideal location for visiting the many attractions available in this part of the Highlands of Scotland. Fort William itself has something for everyone, including a leisure centre which is popular on wet days. Within a short walking distance of Nevis View there is the fascinating Treasures of the Earth exhibition which should not be missed, (tel 01397 772283 for details) and also a very pleasant walk along the canal starting at Corpach basin, leading to the famous Neptune's Staircase system of nine locks on the Caledonian Canal. Also nearby is the Ben Nevis Distillery, where visitors can take a tour around the distillery, visit the gift shop and enjoy a coffee or a snack. Ten miles along the "Road to the Isles" in the opposite direction, you will come to Glenfinnan, the place where Bonnie Prince Charlie raised his standard in 1745 at the start of the Jacobite rebellion. The National Trust Centre is well worth a visit, and if you are feeling energetic you can climb to the top of the Glenfinnan Monument, overlooking beautiful Loch Shiel. Further on from Glenfinnan, the road takes you through the villages of Lochailort and Arisaig to Morar, where there are some of the most beautiful beaches in the country, known locally as the "Silver Sands", before finally reaching the fishing village of Mallaig, from where you can take a ferry to the Isle of Skye and the smaller Isles. If you are interested in hillwalking, for which this area is such a popular destination, why not visit Connery's Scottish Hillwalking website, which carries lots of interesting information about hillwalking in Scotland. Detailed travel information is given below. Local transport timetables including bus, train and ferry are available at Nevis View. However, for any general travel/timetable enquiries, there is a nationwide travel information service available, called Traveline Scotland. One number gives access to information about all rail, coach, bus, ferry and internal air services in Scotland. Telephone 0870 608 2608. All calls will be charged at the national rate. The roads in this area are a pleasure to drive on, with wonderful views. Corpach is well signposted with access from Fort William via the A830 (The Road to the Isles). Once into Corpach, Nevis View is reached by turning right into Farrow Drive, about 0.1 miles on the right after The Treasures of the Earth Exhibition. If you are travelling by bus to Fort William, the Scottish Citylink website gives all necessary timetable details. 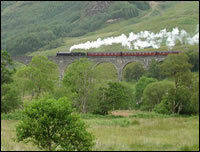 Car Hire is available in Fort William, or you can carry on to Corpach using the train (see below). Nevis View is only a 5 minute walk from the nearest bus stop where bus service Numbers 45, 45A and 46 run four times an hour into and out of the centre of Fort William until 6.30pm and from then hourly. It takes approximately 20 minutes by bus to reach the centre of Fort William. Scotrail runs a regular service from Glasgow Queen Street along the famous West Highland Line. There are four trains a day between Glasgow and Fort William in summer, three and all trains carry on to Mallaig via Corpach. The train station is only half a mile from Nevis View. Timetable details are available on the Scotrail website. The most convenient airports are Inverness (75 miles) and Glasgow (105 miles) from where you can hire a car. Ryanair use Prestwick airport just south west of Glasgow.For taxi travel on arrival in Glasgow, whether within the city or all the way to Fort William, try Glasgow Airport Millennium Taxis. Ferry links to the Inner Hebrides are available from Mallaig, just under a hour's drive from Nevis View. See the Caledonian MacBrayne website for details.